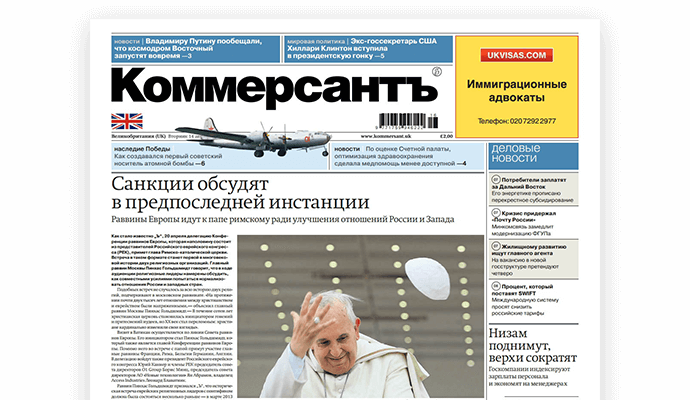 Welcome to Kommersant UK, the most popular and respected Russian language newspaper in the UK. Kommersant UK is the only Russian language newspaper focusing on business and politics in Great Britain. Published twice weekly, it is available in all good newsagents, Russian shops and via subscription. Originating in Russia, Kommersant was founded by Vladimir Yakovlev in 1988. Today it is one the five biggest media houses in Russia and one of only a handful to have UK representation. Its pages are enjoyed by thousands and reveal news and stories from the world of politics, business, economics, culture, sports, and society. Today Kommersant UK delivers the most important and valuable information to the Russian speaking community in the UK, including legislation changes, specifics of business in Great Britain, all major social and business events, success stories and details of new companies founded or managed by Russian speaking residents. Kommersant started as a weekly newspaper in 1989 which grew to become a daily paper by 1992. Apart from the newspaper there are also specialist magazines that focus on various topics such as events, fashion, cars, money etc. Kommersant has also joint projects with TV channel «Perviy Canal». In 2016 Kommersant UK launched its amended and advanced website with more unique UK content and articles from talented journalists. Kommersant UK is a proud media partner of major events in the UK; uniting people and contributing greatly to cultural exchange.